The Beach2Beach is a 2.6km open water swim from Blackmans Bay to Kingston Beach, south of Hobart in Tasmania, Australia’s southern most state. The swim is held annually in March/April and is the final of the Tasmania Ocean SwimSeries. 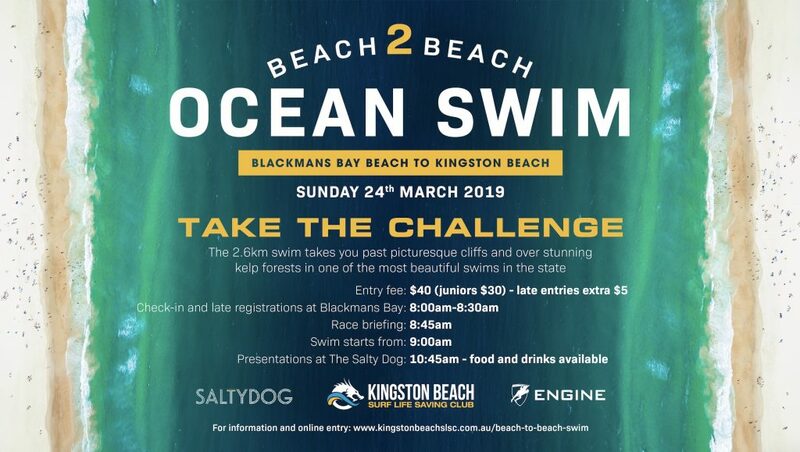 The Beach2Beach takes swimmers past beautiful cliffs and over kelp forests and is one of several open water swims conducted every season by the Kingston Beach Surf Life Saving Club. All entries for the event are preferably to be done ONLINE but there will be late entries available on the day (late entry fees will cost). Where do I leave my bag on the day? What is the swim distance? Is there a cut off time for the swim? Our cut off time is after 1.5 hours. This is due to water safety risk management requirements and also the timing of the presentations. Is breakfast available after the swim? We will be hosting our presentations at the Salty Dog Hotel for the 2019 event so there will be lots of food on offer and special drink prices and deals available for all the swimmers! What time are the presentations? Presentations are conducted around 20-30 minutes after the last swimmer crosses the finish line. The presentations and celebrations are conducted at the Salty Dog Hotel Beer garden (beachfront restaurant). I am travelling from interstate, what are some other activities I can do around Hobart? An ideal itinerary for the weekend would be to visit the Salamanca market on the Saturday morning, cruise to MONA on the MONAROMA ferry, dine in at some of the restaurants on the wharf and experience some fresh local produce and then finish your weekend off by joining us at the swim on the Sunday morning.